Answer: Some people just remember they are loved when they get sick and people around them show them their love and affection. You don’t need to get sick to know you are loved and important! Use your chance to live each day as a proof of how loved and important you are to God and to all. Free your physical, emotional and mental bodies so they can express their next level of health, strength and vitality and let a smile show on your face. When your friends tell you their misfortunes, their aches, problems and so on perhaps all they want is simply that you love them. They want to know they are loved, so give them the best love you have so far found within yourself. You are not alone, this is imposible! You are not alone even in your problems, for there are many people in a similar if not equal situation than yours. Think now of all the people who, like yourself, may be facing an identical challenge as yours. Send them your love and acceptance mentally; trust they can feel your love in some level. Feel you are joining with them to solve your common challenge. You may picture or imagine all of you solving this challenge together to the next level successfully and beautifully. Any comment about this post? Send the Life Coach Giuliano Milan a question about your own life. Your answer may be published here in this blog since it may help others as well. (We do not publish your name or any info that may identify you). 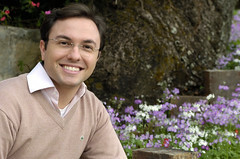 Giuliano Milan is a 35 year old inspirational writer, certified Life Coach and Speaker. He was born in Brazil and started his path of writing in his early twenties. He is a published writer in Brazil and Portugal. Besides giving speeches and trainings within companies, he also coaches CEOs, Directors, actors, olympic athletes and other high performing individuals.